This painting by Seth Eastman shows how the site might have been 150 years ago. Seth Eastman was a military officer stationed at Fort Snelling. Well over a thousand years ago, ancestors of the Shakopee Mdewakanton Sioux, a community of the Dakota Nation, thrived alongside the banks of Mni Sota Wakpa, or the Minnesota River, a place that has held great importance to the people who lived and still live there. This land is now made up of cities such as Shakopee and Eden Prairie. Yet, this great river is still inhabited by its native peoples: American Indians who live among us all today. Alongside the river between Shakopee and Eden Prairie, Flying Cloud Drive serves as the main thoroughfare. In the past decade, the highway has suffered from frequent flooding, a problem that Hennepin County seeks to fix at a more permanent level. To do so, the county will need to build 110,000 ft2 of bridge decking and 95,000 ft2 of retaining wall. But many regulations require pre-construction planning to avoid or minimize damage to the environment or cultural resources. Before these additions can be made to the corridor, federal law requires that Hennepin County work with the U.S. Army Corps of Engineers who are issuing a permit, and talk with tribes to determine if there are any cultural sites that may be affected by the roadwork. But the law doesn’t outline exactly how talks should be conducted and efforts are sometimes approached as a check-the-box effort. Such minimalist approaches can come at great cost to the American Indian tribes. However, Hennepin County saw the value of moving beyond this way of thinking. For this project, great care was taken to hear Dakota voices and to place those voices at the heart of the cultural resources planning and interpretation process. A concept drawing of planned changes to Flying Cloud Drive. Archaeologist Tyler Lund-Kyrola sifts through the dirt beside Flying Cloud Drive. Six significant archaeological sites were studied during this project. Recently, archaeologists sifted through the dirt just a few feet below the ground beside Flying Cloud Drive in Eden Prairie. Looking for any sign of American Indian (Dakota) presence, they soon found arrowheads, pieces of pots, leftover hearths…remnants of an entirely different era in Dakota history. 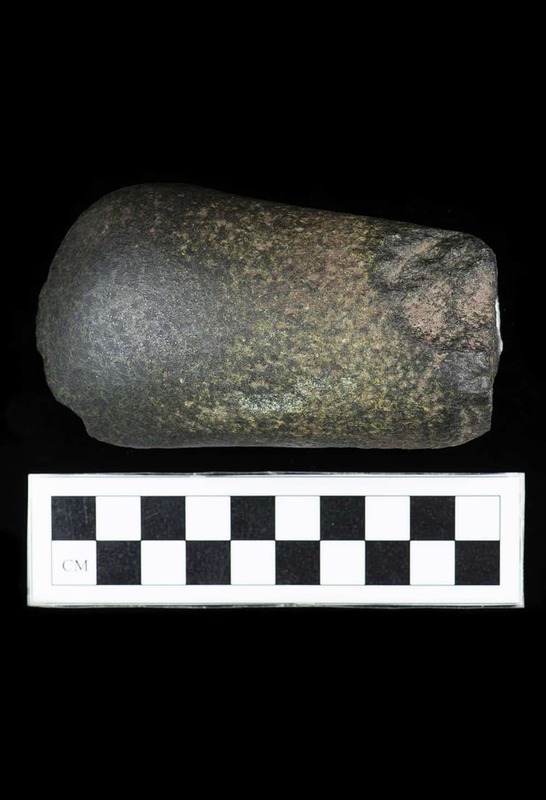 This Groundstone Celt found on-site was likely used as a woodworking tool. Celts often were used for other purposes after being broken, like the one pictured above. The artifacts tell a story about the practices and behaviors of the Dakota. Through these artifacts, one can delineate that the people made, ate, traded, or wore these items throughout the region and across a large period of time. What makes these items and this project unique from an archaeological standpoint is the landscape within which these artifacts were studied. The project included the study of six different significant sites at the same time. This has allowed archaeologists to view American Indian life within a larger landscape. The people who once lived in the area were connected to wide networks that allowed for the sharing of ideas and materials. Some of the stone pieces that were found came from distant sources, illustrating that these networks existed. For example, lithics made of Hixton Quartzite and Knife River Flint were found. These materials came from central Wisconsin and western North Dakota respectively. Other lithics found were made from materials available locally. The arrowhead lithics were all made in a similar way revealing that the knowledge of how to make an arrowhead was wide-ranging, despite the cultural differences between areas. This area was also a permanent home for the people who lived there. There are a number of factors that contribute to this belief. The practice of collecting different resources during different seasons meant that American Indian people were moving around in a sort of rotation, the population of different areas rising and falling in correlation with each part of the cycle. There was also the presence of groundstone celts which are artifacts associated with the clearing away of forest areas using a particular method. This deforestation effort would not have been undertaken for a temporary campsite. In addition, large features that were discovered indicate that American Indians placed great investment into their landscape. In the 3.7 mile stretch of roadside, Dakota history is being interpreted and given new light with the voices of existing tribe members. 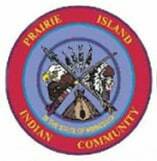 Initiated early in the process, input from representatives of four Dakota tribes (Lower Sioux, Upper Sioux, Prairie Island, and Shakopee) was received, before much of the intensive excavations were conducted. A modern map outlines land owned by American Indian tribes today. Tribal representatives joined archaeologists on-site during the excavations to observe, discuss, participate in, and supply their perspective on the process. Beyond fieldwork, representatives also aided in the study and interpretation of the objects recovered, highlighting their significance. A historical map from 1843 outlining the close, geographical relationship between different tribes of the area. Because of the nature of this project, archaeologists and interpreters were able to look not only at the artifacts, but at those artifacts within the context of the site, at that site within the context of the landscape, and at that landscape within the context of the Dakota Universe. The result of that work is a Dakota story influenced by archaeological evidence – an archaeological story influenced by the Dakota context. Dakota history spans back well over a thousand years, far before the United States of America was able to call itself an independent nation. Indeed, far before Europeans stepped foot on the continent. As is the case for all communities, their relationship with their home is one of great intimacy and substance. These artifacts and stories, by themselves, can create a unique and discovery-filled experience for those who find themselves walking the paths of Flying Cloud Drive. The sites are no longer underfoot, but the story and significance will live on through the onsite interpretation, and most importantly, the Dakota people themselves. The broad and sweeping nature of what was found in the ground along Flying Cloud Drive has the ability to influence the narrative that has been sterilized by stereotype and misinformation. For this project, great care has been taken to engage Dakota voices and to place them at the heart of the interpretation process. Tribal representatives have helped guide and inform our interpretation and the telling of stories about the place, the people who lived here, and their connection to descendants who live there today. 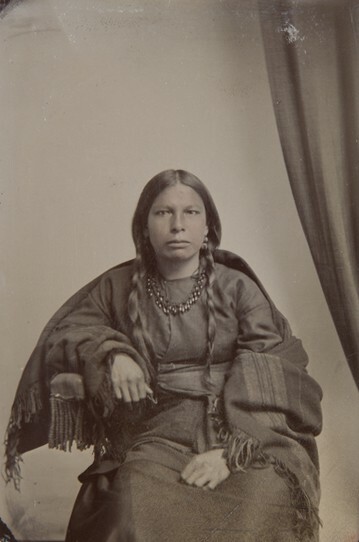 Tintype of a Dakota woman named Mary, reported to have lived near the city of Saint Paul in the mid-nineteenth century. 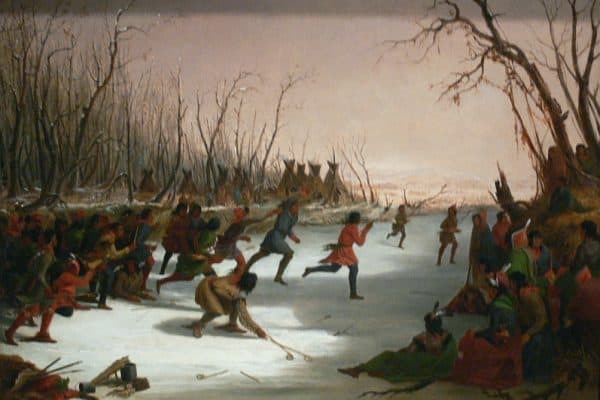 Winter landscape by Seth Eastman depicting a vigorous game of lacrosse played by Dakota Indians on a snow-covered frozen stream, their sticks held high in the air as the men race back and forth, while other members of the tribe watch from the banks. In the background a forest of slender bare trees is silhouetted against the pink evening sky. American Indians have called this land home since before the United States declared its independence from Britain. Those people are still here, thriving within their own culture. Many artifacts were found onsite. These artifacts will be used to further interpret the story of the people who lived here first. If you want to learn more about what was found beneath the surface of Flying Cloud Drive, watch videos curated by our archaeologists, Tyler Lund-Kyrola, Madeleine Bray, and Kate Hunt, and our historian Nicole Foss. We, at the 106 Group, would firstly like to thank Hennepin County for their ongoing management and positive support for this important archaeological and interpretive work. The Office of the State Archaeologist and U.S. Army Corps of Engineers provided regulatory review and insights. The Tribal Historic Preservation Officers and elders from four local Dakota tribes: Upper Sioux, Lower Sioux, Prairie Island, and Shakopee, continue to provide great insights and open dialogue about the archaeological work and the significance of these sites for the Dakota story in this place. Their contributions have made this project so much more meaningful in so many ways, both for our 106 Group team but also those who have and will continue to benefit from the interpretive elements in progress. It is our hope that this type of collaboration will become a model for all future projects of this nature. Everyone’s efforts ensured this project was a great success. Photos of Seth Eastman painting and tintype of Mary, Dakota woman, provided by the Minnesota Historical Society. 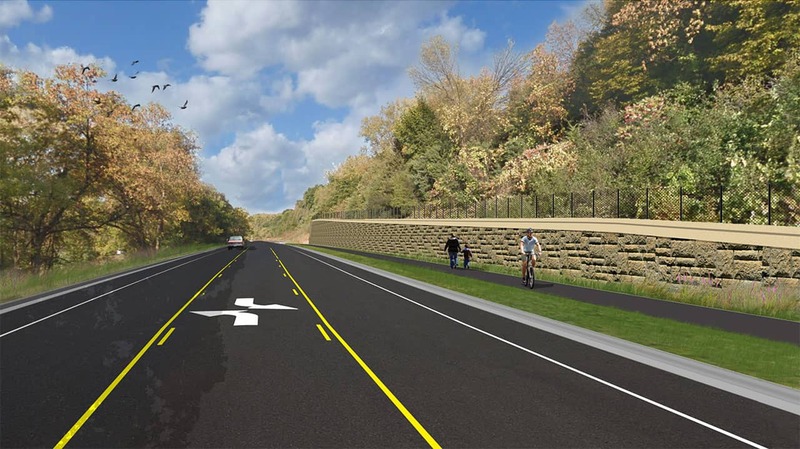 3D model of Flying Cloud Drive reconstruction provided by Hennepin County. Photo of Native American students graduating with SMSC scholarships courtesy of Shakopee Mdewakanton Sioux Community. Photo collage of Dakota American Indians in MN by David Bowman. Adam is the Archaeology Manager at 106 Group. His experience in archaeology spans North America, Central America, and Asia. 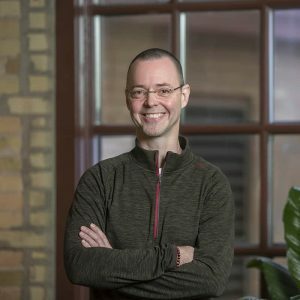 For over a decade, he has been supervising teams comprised of up to twenty archaeologists, students, and laborers in nearly all aspects of archaeology. Steve is the Interpretation and Exhibits Manager at 106 Group. 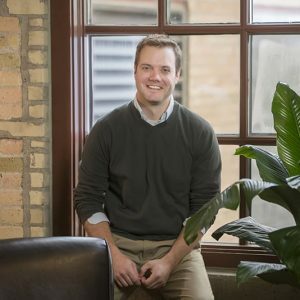 He has made his career eliciting stories and producing meaningful ways for visitors to engage with them. Over the past 25 years, he has created interpretive experiences for dozens of institutions around the country.